Eighty-three years ago today, the end came for Jimmie Rodgers. On May 17, 1933, Jimmie traveled to New York City for what turned out to be his final recording session, during which he had to lie down in-between songs. He cut his last recordings on the 24th, and returned to his room in the Taft Hotel. On May 26, 1933, only two days after waxing his final song, “Years Ago”, Jimmie Rodgers finally succumbed to his tuberculosis, and died in his hotel room of a pulmonary hemorrhage at the age of 35. He had fought T.B. since 1924. At the time of his death, he represented a large percentage of Victor’s total sales deep in the Great Depression. America’s Blue Yodeler left behind a legacy of more than a hundred recorded songs, later going down in history as the Father of Country Music. After Jimmie’s passing, a wave of tributes ensued, including a number of songs by WLS artist Bradley Kincaid, and these tearjerkers by Gene Autry. 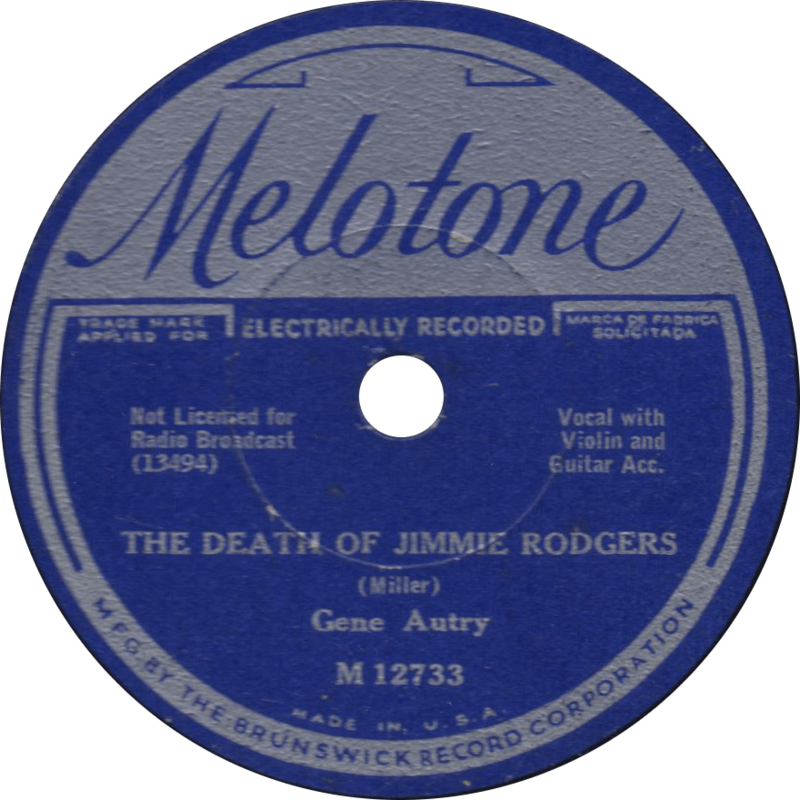 Melotone M 12733 was recorded June 22, 1933, less than one month after Jimmie Rodgers’ death, in New York City by Gene Autry. Both songs were penned by Bob Miller. 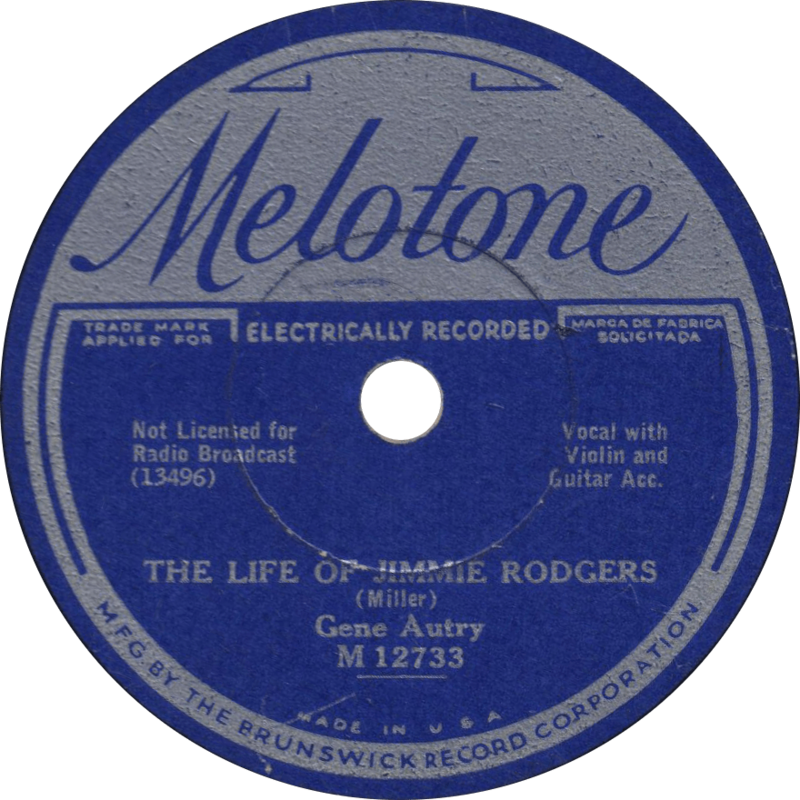 First, Autry sings a reasonably accurate account of Jimmie Rodger’s life on “The Life of Jimmie Rodgers”. The Life of Jimmie Rodgers. recorded June 22, 1933 by Gene Autry. On the flip, he sings a heartfelt tribute to Jimmie on “The Death of Jimmie Rodgers”. The Death of Jimmie Rodgers, recorded June 22, 1933 by Gene Autry. This entry was posted in Records and tagged 1930s, 1933, ARC, Bob Miller, Gene Autry, Hillbilly, Jimmie Rodgers, Melotone, New York by R. Connor Montgomery. Bookmark the permalink.